Foodstuffs Ltd point-of-sale cardboard poster for a Four Square Xmas promotion, probably late 1950s-early 1960s. If you want to read about the history of this iconic brand and huge chain of grocery stores, I wrote about it here. Go for it. Here we are back at the festive season again. I just don’t know what happened to this year; I do know that I’ve only managed to post about six times which is a marked difference from the previous years, understatement. At least a couple of those were substantial. December the first marked five years of the Longwhitekid blog. I had a special image saved and everything, but even though I definitely had something to say on the occasion – I couldn’t make time to do anything with it. This is the fourth or fifth annual Yuletide-themed post. Somehow I managed to gather a huge amount of Christmassy (yes, that is a term, because I say so) stuff into my file for this one; I’m not sure why that happened. However I had a lot to choose from. So, I’ve focussed on the 1950s, 1960s and 1970s this time around -with a palette of red, blue, white and black (mostly). Inevitably, most of the images are commercially related hence the title of this article. I’ll be back around new year with the regular article of the top fifty most popular images of 2015 as voted by my readers. It will probably be quite different since my membership went up by thousands (in part due to a mention in the NZ Herald) and some things got hundreds of likes. I sort of have an idea what the top image was, but the rest will be just as much as surprise to me as it will be to you. Until then, happy holidays and all that stuff. An unsigned illustration from the New Zealand School Journal, part 3, 1957. I’m guessing this is probably the work of Conrad Frieboe, who had a long career working for the Department of Education on various publications from the 1950s through to the 1970s as well as for book publishers and magazines like ‘Stitch’ ( for which he did beautiful work). Image courtesy of the Doris Chadwick Collection of educational publications, D233, NZ School Journals Vols 51, 1907-1960 , UoW Archives. Advert from Whittaker’s chocolate Christmas campaign, 2012. Sante does indeed exist, and has for a very long time in Aotearoa. Although the line has almost become a ‘brand’ in its self for this company, it was once considered pretty much generic – and everyone from ‘Hudson’s’ to ‘Beatall’ had a crack at it over time. Cover of a Christmas brochure for DIC department stores. This chain, originally named the ‘Drapery and General Importing Company of New Zealand Ltd’, was founded in 1884 by one of the Hallensteins – Bendix (1835-1905). He was also responsible for founding, earlier in 1873, what was to become Hallenstein Brothers – one of the country’s most successful brands historically, and still going today. DIC grew to at least thirteen stores around the country until it was phased out in 1991, after being taken over by rival Arthur Barnett’s. Image courtesy of Owain Morris collection. Santa parade of 1958, along Cambridge Terrace, Wellington. This must be the same annual James Smiths Ltd department stores-sponsored one that travelled the same route, which I wrote about here. Image courtesy of Wellington City Libraries collection. Farmers Trading Company’s famous free bus from Karangahape Road, arriving at the Hobson Street store with Santa in place in his original location. Of course this building is now a boutique hotel, so these days he is on the front of the Whitcoull’s store in Queen Street, where he’s been placed every season for quite some time now. In recent years his lascivious wink and beckoning finger have been removed because parents are weird about stuff that’s all in their head and nobody else’s. Thanks for making Santa dirty, folks. Image possibly taken in the early 1970s (this looks like one of those old green buses), courtesy of Graham C. Stewart, from the Garth Stewart collection. A promotional Christmas cake tin given as gifts to customers of ‘The Maple.’ Presumably this refers to home decorating institution the Maple Furnishing Co Ltd, which was on the north side of Karangahape Road, Auckland near Symonds Street, as well as branches in Onehunga and Wellington. 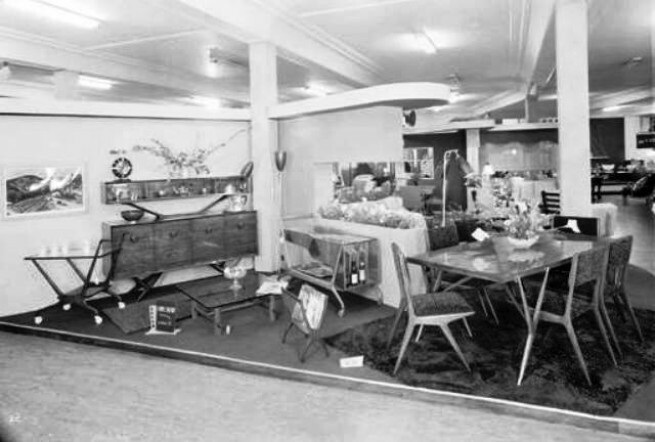 It had been around since the 1910s, being known for high end furniture – including designer Featherston of the famous and highly collectable chairs. You can see another 1920s picture of the business here. It was purchased by Smith and Brown in about 1970 who had a chain of over twenty stores around the country. It became Smith & Brown & Maple but only lasted until around 1979. I am guessing this tin dates from the early-mid 1960s. I suspect it may have been done for the business by cake manufacturers Newdick & Co who were also situated close by and are known to have specialized in decorative Xmas tins to market their products. Santa Parade, 1969, High Street, Dannevirke. Tip-Top’s ‘Moggy Man’ novelty started out as the iconic baby boomer icy treat the ‘TT2’ in the fifties – and lasted into the 1970s. I’ve previously written about the historical development of the product here. 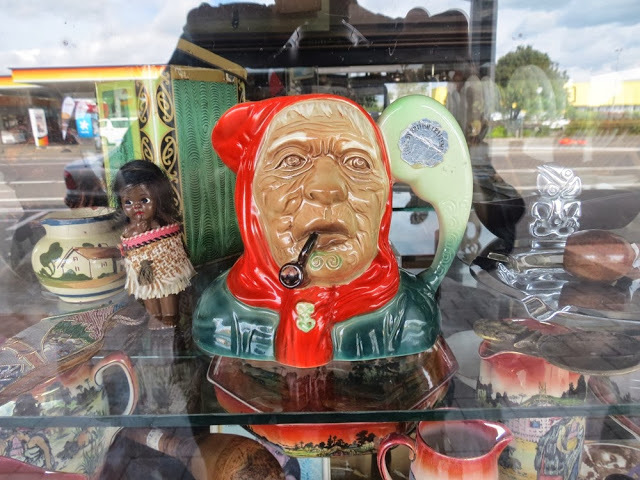 Image courtesy of the Dannevirke Museum collection. A family around the Christmas tree, from the Oamaru Mail, 1965. Image courtesy of the North Otago Museum collection. Illustration by one of my favourite Kiwi illustrators, Clouston. Evelyn Maryon Clouston was born in Auckland in 1906, and had a lengthy career designing for the School Publications Branch, Department of Education in Wellington , as well as for various publishers such as Whitcombe & Tombs and Paul’s Book Arcade. She also worked for publishers in London for a spell. Image from NZ School Journal, Parts 1 & 2, 1957, courtesy of the Doris Chadwick Collection of educational publications, D233, NZ School Journals Vols 51, 1907-1960 , UoW Archives. An advert from a GHB cookbook, published 1966. GHB was a smaller, lesser known chain of grocery stores with a self line (tea, soap powder, etc), that existed from the 1950s until some time in the 1980s. It stood for ‘Good Housekeeping Brand’ (I don’t think it had anything to do with the magazine of the same name). They were still significant enough to issue several versions of this tome through the fifties and sixties. I get the idea it was located around the upper half of the North Island only. Locations I know of were Auckland, Dannevirke, Pahiatua, Kaikoura, and Hawke’s Bay. Image courtesy of Mike Davidson collection. These two recipes from Goldpack are almost considered Kiwi classics as perhaps anything out of the good old Edmond’s ‘Sure To Rise’ cookbook is. I covered the topic of the Xmas cake and pud here when I wrote about this Butland Indstries brand back in September 2012. A ‘Cinderella’ issued by the New Zealand Tuberculosis Association in 1955 to raise charity funds. Cinderellas were a kind of stamp that were not official New Zealand post issue and were primarily decorative. They usually served two main purposes – fund raising or promotion. As such, they are their own special area of collecting and some can fetch high prices – such as early pigeon post stamps. Colourful and charming, they were popular during the festive season and I have a collection of Christmas ones that I will probably feature next year. Now, this one is special to me. It’s an American McCall’s magazine – but they were sold in New Zealand. My mother was a bit of a fan, especially of the annual Christmas issues – and we had stacks of them sitting around that went back to the mid sixties. The Yuletide issue was always an amazing, over the top extravaganza; the kind of Christmas you could only dream of. The cakes, desserts and gingerbread house spreads were especially amazing, covered in Yankee candies that you could not get down under. I’m not sure of the date for this particular one, but it would be after 1964. New Zealand Woman’s Weekly magazine, early December edition, 1953. Another illustration from the New Zealand School Journal, part 3, 1957. It looks like it’s signed ‘L.F.’ but it’s actually C.F., so definitely the work of the very talented Conrad Frieboe, whom I have already covered up near the top of this post. Image courtesy of the Doris Chadwick Collection of educational publications, D233, NZ School Journals Vols 51, 1907-1960 , UoW Archives. Woman holding a Christmas decoration made entirely of silver milk bottle tops, Wellington, 1957. Cellulosic film negative, taken for the Evening Post newspaper by unidentified staff photographer. Image courtesy of the Alexander Turnbull Library collection, ref EP/1957/4948-F.